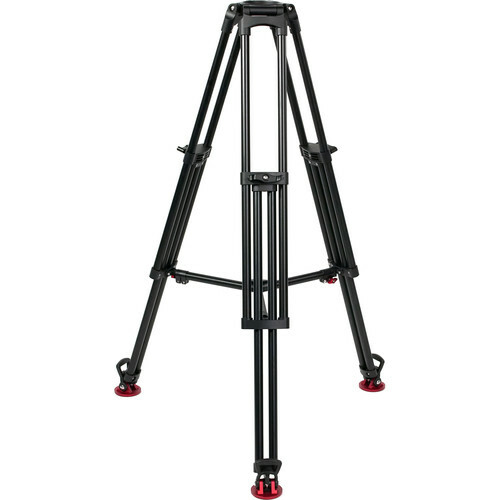 Height Range: 28.7 to 58.6"
Give your camera solid feet to stand on with the 100AL1HD 100mm Single-Stage, Heavy-Duty Aluminum Tripod from OZEN. Designed for heavy-payload and high-fluid-drag applications, this single-stage tripod supports up to 99 pounds and offers working heights ranging from 28.7 to 58.6". For greater rigidity, the 22mm diameter heavy-duty aluminum tripod leg tubes are pin-secured to their anchors—no glued joints. Twist brake levers with positive stops are used to lock the legs into place. Moreover, the 100AL1HD comes equipped with a Contender heavy-duty mid-level spreader, as well as with deep-tread rubber feet for better traction on smooth surfaces.